The decline of manufacturing in the United States over the past 15 years has been well documented: 5.4 million manufacturing jobs and over 82,100 manufacturing establishments were lost between 1997 and 2013. There is a common but incorrect idea that high wages in U.S. manufacturing are causing growing job losses and declining U.S. export competitiveness. Germany has among the highest manufacturing wages in the world but maintained a stable share of world exports throughout this period and suffered only minimal manufacturing job losses, most of which occurred in the wake of the Great Recession. Meanwhile, manufacturing wages in Germany exceeded those in the United States by more than one-third through much of this period. The decline of American manufacturing over the past 15 years is due to currency manipulation and unfair trade, and not high wages. China and Germany both benefited from exchange rate policies that reduced the cost of exports and raised the cost of imports. In the Chinese case, the cause was direct, sustained currency manipulation. In Germany, real exchange rates fell due to flaws in the structure of the European Union, but the end result was the same: currency misalignments that resulted in growing trade surpluses. These countries effectively engaged in “beggar thy neighbor” trade policies that exported unemployment to trade partners, and supported employment in their own countries, especially in manufacturing industries. In addition to currency manipulation, China illegally subsidizes and shares cyber espionage findings with Chinese companies. It also makes huge investments in “leading and pillar” industries, resulting in substantial excess capacity in many industries, which in turn leads to massive increases in exports of subsidized and dumped products (i.e., products sold below cost). The effect of these policies can be seen in the data: Between 1997 and 2013, China’s total share of world exports of manufactured goods more than quadrupled from 3.9 percent to 17.6 percent, and Germany’s share declined only slightly from 11.0 percent to 10.4 percent. Meanwhile, the U.S. share fell by nearly one-third, from 13.7 percent to 9.5 percent. 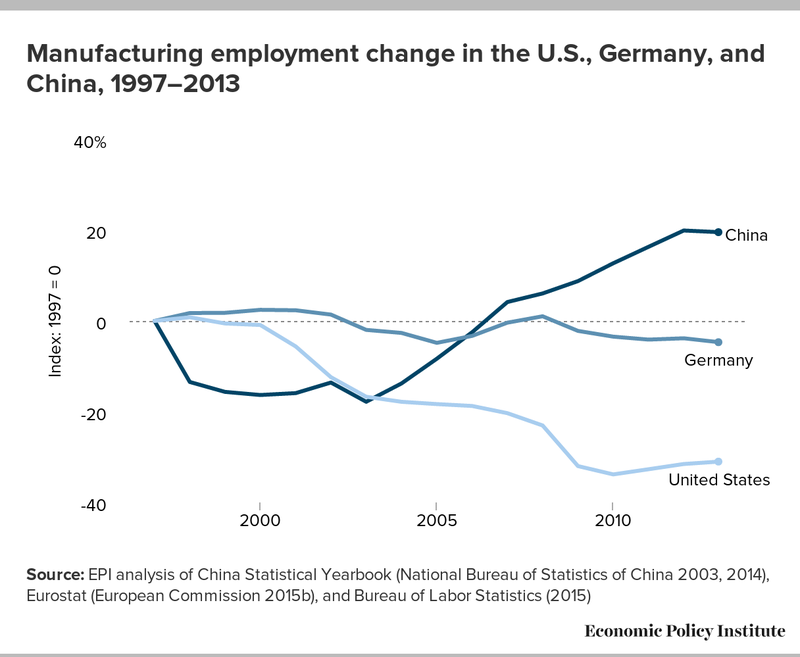 As production of manufactured goods for export to the world shifted from the United States to China, U.S. manufacturing employment also declined sharply—by 31.0 percent (5.4 million jobs) between 1997 and 2013, while manufacturing employment fell only 4.7 percent in Germany. In 2013, average hourly manufacturing compensation in Germany ($48.98) was more than one-third higher than in the United States ($36.34). 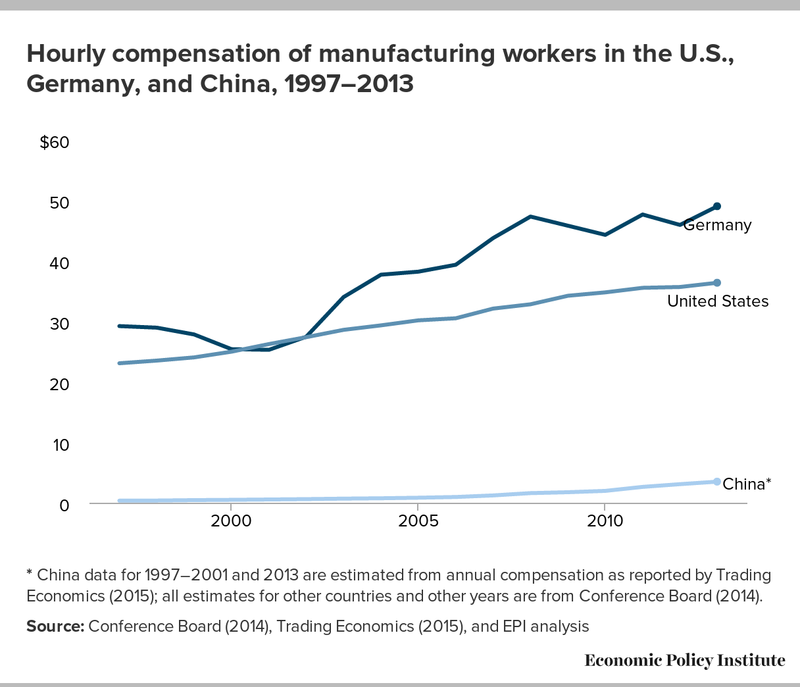 Between 1997 and 2013, manufacturing compensation grew faster in Germany (3.3 percent a year) than in the United States (2.9 percent a year). If high wages alone were sending production to China, then surely Germany would not have held its exports steady: The gap between manufacturing compensation in Germany and China grew from $28.83 per hour in 1997 to $45.49 in 2013. Because high wages are not to blame for manufacturing job loss in the United States, the U.S. can rebuild manufacturing without cutting manufacturing wages. The strategy of pushing manufacturing into the low-wage, nonunion southern states is a race-to-the-bottom strategy that should be rejected in favor of high-road strategies: fighting currency manipulation and doing more to rebuild American manufacturing, taking a page from the German and European models (with supply-side policies that benefit and support the manufacturing sector, including increased spending on research and development as a share of gross domestic product; support for “stakeholder capitalism” in which boards of directors include an equal number of representatives of workers and managers; and heavy investment in training and job creation). In a widely quoted study, the Boston Consulting Group (BCG) conditioned its forecast that “manufacturing will return to the U.S.” on the maintenance of low-wage, anti-union environments in states with a “favorable [deregulated] investment climate.” The study predicted that states such as Alabama, South Carolina, and Tennessee will “be among the least expensive production sites in the industrialized world” (Sirkin, Zinser, and Hohner 2011). Other authors have suggested that these conditions would lead to an “insourcing boom” (Fishman 2012) and an increase in “reshoring” (Northam 2014). However, there is growing concern that current market conditions are not favorable for a recovery of manufacturing, and that, to date, the “reshoring trend has little impact on the U.S. economy” (Zarroli 2014). In fact, the steady growth of the U.S. manufacturing trade deficit has begun to erode recent gains in manufacturing employment (Scott 2015b). The BCG study emphasizes the importance of low wages as a key factor in explaining the location of manufacturing production. However, while labor costs are certainly an important part of production costs, this study will show that high wages are not a barrier to strong export performance. 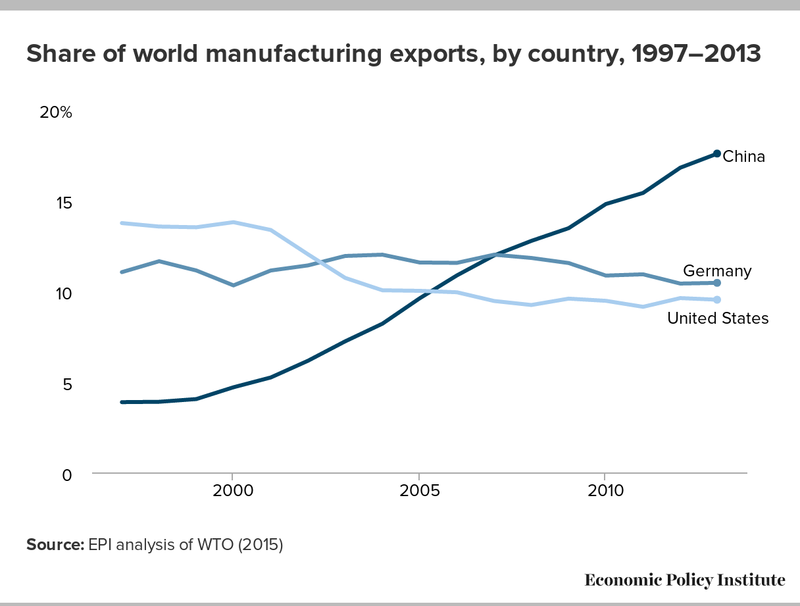 In fact, Germany, a country with manufacturing compensation costs more than one-third higher than those in the United States, has maintained strong export performance over the past 15 years despite the rapid growth of exports from China and other export powerhouses, as shown below. Between 1997 and 2013, China captured a rapidly growing share of total world exports of manufactured goods. China’s total share of world exports of manufactured goods more than quadrupled from 3.9 percent to 17.6 percent, as shown in Figure A. During the same period, the U.S. share of world manufacturing exports fell by nearly one-third, from 13.7 percent to 9.5 percent. Germany, however, was able to hold its own in world markets in this period, and its share of world markets for manufactured exports was essentially flat, declining only slightly from 11.0 percent of world exports in 1997 to 10.4 percent in 2013, a loss of only 0.6 percentage points (5 percent). The total value of world manufactured exports nearly tripled in this period (in nominal dollar terms), rising from $4.0 trillion in 1997 to $11.8 trillion in 2013 (WTO 2015). There was very little inflation in goods prices in this period, at least in the United States, in part due to intense import competition. In the United States, the GDP deflator for personal consumer expenditures on goods increased only 13.2 percent in this entire period, or 0.8 percent per year (BEA 2015). Thus, most of the growth in world goods trade was likely due to increases in the real volume of goods flows. China’s gains in world export markets clearly came at the expense of workers in the United States and other countries. As production of manufactured goods for export to the world shifted from the United States to China, U.S. manufacturing employment also declined sharply. Figure B shows percentage gains and losses in employment for these three countries, relative to base-year employment in 1997. The data are presented in index-number format to illustrate relative changes in employment in this period, which was necessary because the absolute levels of employment are very different, as shown below. China has experienced massive and sustained growth in manufacturing employment, both before and after the Great Recession. 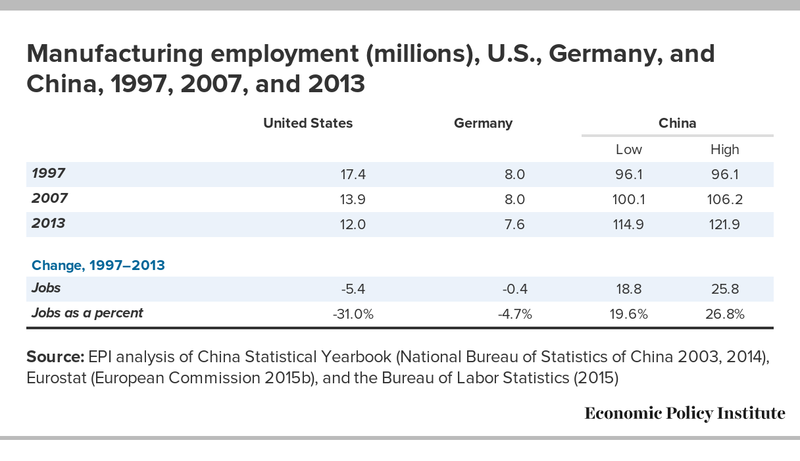 Table 1 presents two different sets of estimates for total manufacturing employment in China. These data show that China has created between 18.8 million and 25.8 million manufacturing jobs between 1997 and 2013, an increase of between 19.6 percent and 26.8 percent in total manufacturing employment. In both estimates, the bulk of these jobs were gained in the wake of the recession. These data illustrate the degree to which China has exported unemployment to the rest of the world, and to the United States in particular. What’s behind changes in world export shares? The BCG story implies that high wages in the United States were the primary cause of outsourcing and the shifts of manufacturing to China. Likewise, the BCG report claims that manufacturing will return to the United States because Chinese wages are increasing and low-wage workers are available in nonunion states in the southern United States. For similar reasons, BCG claims that China will remain a “manufacturing platform” for Europe, presumably because wages are higher there. But it’s a simple and incomplete story that misses the larger picture. In the first place, Germany has managed to compete very well with China (and the United States) in world export markets, as shown in Figure A, despite having much higher hourly compensation than the United States throughout most of the 1997–2013 period, as shown in Figure C. In 2013, average hourly compensation in Germany ($48.98) was more than one-third higher than in the United States ($36.34). Second, manufacturing compensation in China has increased rapidly in recent years, as shown in Figure C, rising at about 15.5 percent per year throughout the 1997–2013 period, much faster than in Germany (3.3 percent) and the United States (2.9 percent). However, the absolute gap between, for example, Germany and China, has actually increased substantially in this period, increasing from $28.83 per hour in 1997 to $45.49 in 2013. Despite all this, Germany has managed to maintain relatively stable shares of world export markets, while the United States, with lower wages, has not, as shown in Figure A. * China data for 1997–2001 and 2013 are estimated from annual compensation as reported by Trading Economics (2015); all estimates for other countries and other years are from Conference Board (2014). Low wages do not explain China’s export boom—after all, other large developing countries (such as India) had low manufacturing wages, similar to China’s, and have not experienced a similar surge in exports.2 There are several other factors that have fueled the massive growth in China’s exports. First and foremost is currency manipulation. China has been spending nearly one-half trillion dollars per year on foreign currency assets (about 70 percent denominated in dollars) in order to suppress the value of its currency.3 Currency manipulation by China and about 20 other countries, most of which are in Asia, has increased the U.S. trade deficit by between $200 and $500 billion per year (Bergsten and Gagnon 2012). It has also increased the trade deficit of the European Union by between $150 billion and $200 billion per year. China also engages in massive illegal subsidies and has supported rapid growth of planned public investments in “leading and pillar” industries in China’s five-year development plans (British Chamber of Commerce in China 2011). Combined, these factors have caused sustained overproduction and creation of substantial excess capacity in many industries, including the steel, glass, paper, and auto parts industries, resulting in widespread dumping (sales below cost) (Stewart et al. 2014; Haley 2008, 2009, 2010, 2012). In addition, China has instituted many other illegal restrictions on imports of manufacturing products and natural resources, and on exports of crucial raw materials, such as rare earth metals (Scott 2012). China’s intelligence services also steal economic secrets from private U.S. companies and share what is learned with Chinese companies, creating wanton and systematic violations of international patent and copyright obligations (Wessel 2015). China’s cyber espionage has helped Chinese companies minimize research expenditures and freely capitalize on advances in the U.S. without paying for or engaging in innovation of their own. All of these things artificially depress the costs of Chinese goods and thus inflate Chinese exports to the United States, the European Union, and other countries, while also limiting China’s industrial imports. As a result, China has developed a growing global trade surplus in manufactured products that exceeded $900 billion in 2013, and increased to over $1 trillion in 2014 (World Trade Organization 2015). Germany differs from the United States in several key respects. First, China primarily intervenes in currency markets by purchasing assets denominated in U.S. dollars. Thus, effects on the euro are less direct than on the dollar. The U.S. dollar gained nearly 20 percent against major currencies, including the euro, between June 2014 and October 2015 (Scott 2015b). Second, Germany is, in many ways, the China of the eurozone. Real wages in Germany increased more slowly than elsewhere in Europe. From 1997 to 2013, manufacturing compensation increased 67.9 percent in Germany, compared with 81.7 percent in the eurozone overall, and 96.1 percent in the southern countries of Italy, Portugal, and Spain (simple average) (Conference Board 2014). As a result, prices in Germany increased more slowly than elsewhere in the EU. Producer prices, which reflect the combined effects of productivity growth and changes in wages and other input costs, increased only 23.3 percent in Germany between 1997 and 2013, compared with 32.2 percent in the eurozone and 42.8 percent in the three southern countries listed above (OECD 2015a). Therefore, in the context of a fixed exchange rate within the EU, Germany effectively devalued within the eurozone,4 and became much more competitive than its neighbors. Fourth, despite its success in international markets, Germany itself maintains remnants of domestic protectionism, including strong consumer preferences for German-branded products, and strict controls on entry for firms and business wishing to engage in production within Germany (Karaca 2014). In addition, the U.S. lagged behind (far behind, in several important cases) other major, developed and developing countries in spending on research and development as a share of gross domestic product in manufacturing in 2012, with China (3.79 percent), Korea (3.58 percent), Japan (1.92 percent), Germany (1.56 percent), and Finland (1.4 percent) all ranked ahead of the United States at 1.29 percent (OECD 2015c).7 And there are other important differences between the German and U.S. models. German manufacturers practice “stakeholder capitalism” in which boards of directors include an equal number of representatives of workers and managers (Meyerson 2011). Germany, and many other EU countries, especially the Northern European countries such as Sweden and Denmark, invest heavily in training and job creation, as well as in maintenance of an extensive social safety net for displaced workers with various “Flexicurity” systems (European Commission 2015a). The European models are by no means perfect. European countries have been less willing to confront China about currency manipulation than the United States (though the Chinese currency remains heavily undervalued relative to the U.S. dollar). Germany’s real devaluation has hurt employment and output in the rest of Europe, and in the United States. And Europe is considering policies, such as the unilateral grant of market economy status to China, that could greatly increase EU exposure to imports from China and lead to increased trade-related job displacement (Scott 2015c). To date, however, the United States and Germany present two starkly contrasting responses to unfair trade from China. The United States, through its tolerance of China’s unfair trade policies and in its failure to provide a supportive environment for manufacturing, has allowed U.S. industries to wither, resulting in the loss of nearly one-third of manufacturing jobs in the past 15 years. Germany, on the other hand, has actively developed high-road strategies that supported manufacturing and encouraged firms to maintain domestic employment. As a result, manufacturing employment has been relatively stable in Germany over this period, despite maintaining substantially higher manufacturing wages than the United States, due in part to its implicit exchange rate policies. Unfair trade by China, through currency manipulation and other policies, is a growing threat to manufacturing output and employment in both the United States and Europe. Both would be better off coming together to confront China’s unfair trade and currency policies. And the U.S. needs to adopt “high-road” manufacturing strategies from Germany and other successful, developed economies that have allowed them to develop and maintain a prosperous, successful manufacturing environment that has sustained growing output and stable manufacturing employment. China ceased publication of comprehensive data on manufacturing employment after 2002. Data for total manufacturing employment for the years 1978–2002 are available in the China Statistical Yearbook 2003 (National Bureau of Statistics of China 2003, Table 5-5, p. 128). The China Statistical Yearbook has also continuously published data since 1978 on total national employment in three major sectors of the economy: primary (agriculture and other natural resources), secondary (“mining and quarrying, manufacturing, production and supply of electricity, water and gas, and construction”), and tertiary (all other) (National Bureau of Statistics of China 2014, explanatory notes, Chapter 3). Comparing data on manufacturing and secondary employment for the 1978–2002 period, the manufacturing share of secondary employment fell continuously from 1978 to 2001, when China joined the World Trade Organization, and then jumped sharply from 49.6 percent of total secondary employment in 2001 to 52.6 percent in 2002. China’s exports rose sharply after its entry into the WTO, which is correlated with this jump. Thus, we use these two estimates of manufacturing employment shares in 2001 and 2002 to generate a range of estimates of total manufacturing employment in China in the 2003–2013 period, as shown in Table 1. The lower of these two estimates is displayed in Figure B, to be conservative. In Europe, recent (2008) revisions to the statistical classification of economic activities (the Statistical Classification of Economic Activities in the European Community, commonly referred to as NACE, Rev 2) reduced total manufacturing employment estimates in that year by 4.7 percent (European Commission 2015b, 2015d). Unlike the United States, where recent North American Industry Classification System (NAICS) 2007 revisions were used by the Bureau of Labor Statistics to produce revised estimates of manufacturing employment dating back to 1939 (BLS 2015), NACE Rev 2 data are unavailable for years prior to 2008 (this is the only year for which overlapping NACE employment estimates were available) (European Commission 2015b). Thus, NACE 1.1 estimates of manufacturing employment in Germany were revised down by 4.7 percent for the years prior to 2008 for presentation in Figure B, to reflect the NACE Rev 2 changes. — The author thanks Josh Bivens, Ross Eisenbrey, and Michael Wessel for comments, and Elizabeth Glass and William Kimball for research assistance. Robert E. Scott is director of trade and manufacturing policy research at the Economic Policy Institute. He joined EPI as an international economist in 1996. Before that, he was an assistant professor with the College of Business and Management of the University of Maryland at College Park. His areas of research include international economics and trade agreements and their impacts on working people in the United States and other countries, the economic impacts of foreign investment, and the macroeconomic effects of trade and capital flows. He has a Ph.D. in economics from the University of California-Berkeley. 1. U.S. manufacturing job loss following the Great Recession (13.4 percent of manufacturing employment in 2007, or roughly 1.9 million jobs) was three times as large, as a share of pre-recession employment as the employment decline in the same 2007–2013 period in Germany (300,000 jobs, 4.3 percent), as shown in Table 1 (using unrounded data; totals in Table 1 may not add to this due to rounding). 2. Hourly compensation costs in manufacturing in India rose from $0.73 per hour in 2002 to $1.59 per hour in 2011. During the same period, hourly manufacturing compensation in China rose from $0.60 per hour in 2002 to $2.62 per hour in 2011 (Conference Board 2014). 3. Author’s analysis of data reported in Scott (2015d). 5. The EU trade deficit with the world disappeared in 2012 and was roughly balanced in 2013–2014. European imports fell as the EU slipped into recession in 2013–2014, and EU exports increased, due to the sharp fall in the value of the euro in the past 18 months, which combined to improve the EU trade balance (European Commission 2015c). 6. Data in this section are based on Scott (2013, 16–20). 7. The United States ranked tenth among all 26 countries in the OECD, with overall research and development expenditures equal to 2.75 percent of total GDP, and far behind leaders Israel and Korea (both in excess of 4.0 percent of GDP), followed by Japan, Finland, Sweden, Denmark, and Taiwan (in excess of 3.0 percent of GDP), and Austria and Germany, at 2.95 percent and 2.85 percent, respectively (OECD 2015b). Bergsten, C. Fred, and Joseph E. Gagnon. 2012. Currency Manipulation, the US Economy, and the Global Economic Order. Peterson Institute for International Economics, Policy Brief 12-25. British Chamber of Commerce in China. 2011. China’s Twelfth Five Year Plan (2011–2015)—the Full English Version. Conference Board. 2014. “International Comparisons of Hourly Compensation Costs in Manufacturing, 2013: Data Tables.” Excel sheet downloaded Oct. 12, 2015. European Commission. 2015c. Eurostat. “International Trade Database.” Spreadsheet downloaded Oct. 19. Feldstein, Martin. 2012. “The Failure of the Euro: The Little Currency that Couldn’t.” Foreign Affairs, vol. 91, no. 1, 105–116. Fishman, Charles. 2012. “The Insourcing Boom.” Atlantic, vol. 310, no. 5. Haley, Usha C.V. 2008. Shedding Light on Energy Subsidies in China: An Analysis of China’s Steel Industry From 2000–2007. Alliance for American Manufacturing. Haley, Usha C.V. 2009. Through China’s Looking Glass: Subsidies to the Chinese Glass Industry From 2004-08. Economic Policy Institute, Briefing Paper #242. Haley, Usha C.V. 2010. No Paper Tiger: Subsidies to China’s Paper Industry From 2002 – 09. Economic Policy Institute, Briefing Paper No. 264. Haley, Usha C.V. 2012. Putting the Pedal to the Metal: Subsidies to China’s Auto-Parts Industry from 2001 to 2011. Economic Policy Institute, Briefing Paper No. 316. Karaca, Emre. 2014. “German Consumer Protection or Protectionism?” America’s Trade Policy. Washington International Trade Association. Meyerson, Harold. 2011. “Back from China.” The American Prospect, vol. 10, no. 22. National Bureau of Statistics of China. 2003. China Statistical Yearbook 2003. Publication No. 22. National Bureau of Statistics of China. 2014. China Statistical Yearbook 2014. Northam, Jackie. 2014. “As Overseas Costs Rise, More U.S. Companies Are ‘Reshoring.’” National Public Radio, Jan. 27. Organization for Economic Cooperation and Development (OECD). 2015a. “OECD Data: Prices, Producer Price Indices.” Spreadsheet downloaded Oct. 19. Organization for Economic Cooperation and Development (OECD). 2015b. “OECD Data: Research and Development (R&D): Gross domestic spending on G&D.” Spreadsheet downloaded Oct. 26. Organization for Economic Cooperation and Development (OECD). 2015c. “OECD.Stat: Business Enterprise R-D Expenditure by Industry (ISIC 4).” Spreadsheet downloaded Oct. 21. Scott, Robert E. 2012. “U.S. Sends the Right Message with WTO Complaint on China’s Illegal Restrictions on Rare Earth Exports.” Working Economics (Economic Policy Institute blog), March 14. Scott, Robert E. 2013. Reducing U.S. Trade Deficits Will Generate a Manufacturing-Based Recovery for the United States and Ohio. Economic Policy Institute, Briefing Paper No. 351. Scott, Robert E. 2015a. “By Devaluing Its Currency, China Exports Its Unemployment.” Working Economics (Economic Policy Institute blog), August 12. Scott, Robert E. 2015b. “Failure to Stem Dollar Appreciation Has Put Manufacturing Recovery in Reverse.” Working Economics (Economic Policy Institute blog), October 9. Scott, Robert E. 2015c. Stop Currency Manipulation in the Trans-Pacific Partnership: Millions of Jobs at Stake. Economic Policy Institute, Policy Memo #206. Scott, Robert E. 2015d. Unilateral Grant of Market Economy Status to China Would Put Millions of EU Jobs at Risk. Economic Policy Institute, Briefing Paper No. 407. Sirkin, Harold L., Michael Zinser, and Douglas Hohner. 2011. Made in America, Again: Why Manufacturing Will Return to the U.S. The Boston Consulting Group. Stewart, Terence P., Elizabeth J. Drake, Jessica Wang, Stephanie M. Bell and Robert E. Scott. 2014. Surging Steel Imports Put Up to Half a Million U.S. Jobs at Risk. Economic Policy Institute, Briefing Paper No. 376. Trading Economics. 2015. China Average Yearly Wages in Manufacturing: 1978-2015. U.S. Census Bureau. 2015. “Firm Characteristics Data Tables: Firm Size by Sector.” Spreadsheet downloaded Oct. 13. Wessel, Michael. 2015. “Why the U.S. Should Be Wary of Chinese Money: China’s Investment Comes with a Hidden Agenda. And a Secretive New Treaty is About to Make it Worse.” Politico Magazine, September 24. World Trade Organization (WTO). 2015. “Statistics database: Time Series on International trade.” Excel sheet accessed Oct. 20. Zarroli, Jim. 2014. “‘Reshoring’ Trend has Little Impact on U.S. Economy, Study Finds.” National Public Radio, Dec. 16.